It has long been the case that a change in presidential administrations—particularly where the outgoing president is of one party and the president-elect of another—creates a flurry of executive actions. The weeks between Election Day and Inauguration Day are typified by a rush from the outgoing administration attempting to complete administrative actions and cement its policies prior to the arrival of the next administration. Likewise, the first one hundred days of a new administration are characterized not only by action to effectuate bold new policy objectives, but also by efforts to reverse or limit the impacts of the prior administration’s executive actions. The next several months can be expected to see the return of this familiar pattern with the Obama Administration attempting to take final action on policy priorities prior to January 20, 2017, followed by efforts by the incoming Trump Administration to undo many of those actions. This alert briefly describes the range of executive actions that one might expect to see over the next several months. In the coming days and weeks, Van Ness Feldman will provide further analysis on this and other issues related to the transition. In a previous alert, the firm identified actions a Trump Administration could take to re-set climate policies. While the Obama Administration likely will seek to complete many initiatives before leaving office, the Trump Administration and the Congress have certain tools available to try to reverse policies adopted in the final days of the Obama Administration. Perhaps the most durable actions the Obama Administration can take in these final weeks are issuance and publication in the Federal Register of final rules for which rulemakings are near the end of the administrative process. The Obama Administration will likely seek to issue and publish in the Federal Register a number of final rules in pending rulemaking proceedings, where the necessary preliminary steps of soliciting and addressing public comments on proposed rules under the Administrative Procedure Act (APA) have been completed. Once published in the Federal Register, these “midnight” regulations will be “on the books” and regulatory changes or rescission would generally require a separate rulemaking process. Delay of Effectiveness. The Trump Administration might consider issuing an executive order or memorandum imposing a 60-day delay on the effective date of all final rules that have not yet gone into effect (except those subject to statutory or judicial deadlines). This strategy—which was employed to varying degrees by the Reagan, George W. Bush, and Obama Administrations—would allow the Trump administration to review the Obama Administration’s midnight rulemakings and would also give the new administration time to nominate and put into place its chosen politically-appointed officials to gain control over the executive agencies. Once the 60-day period lapses, delayed rules go into effect or an agency undertakes further notice and comment rulemaking to amend or rescind the rule as outlined below. Revision or rescission. As with the promulgation of any rulemaking, formally changing or reversing Obama Administration final regulations would be a lengthy and, for certain regulatory actions, challenging process for an incoming administration. Doing so requires an agency to comply with the public notice- and-comment requirements of the APA and to provide a “reasoned explanation” for changing course. Failure to take these steps provides grounds for successful legal challenges in the federal courts to vacate the revisions as “arbitrary and capricious” under the APA. Thus, any final rule that the Obama Administration publishes prior to Inauguration Day would remain in force (though, as outlined above, may be delayed) unless and until (1) the incoming Administration revises the new regulation, (2) the regulation is vacated by a court, or (3) the Congress takes action. Request voluntary remand, decline to defend legal challenges, or decline to appeal adverse judicial decisions. A number of the Obama Administration’s signature regulatory actions are currently subject to litigation or will become subject to litigation upon promulgation. To the extent that courts have not yet issued decisions on these rules by January 20, a new Trump Administration may request a voluntary remand to revise or rescind the rules (pursuant to notice-and-comment rulemaking as outlined above). Such a request for remand would likely be opposed by those intervenors supporting the regulations. For any regulation that is upheld by a court, a new Trump Administration may choose not to defend the regulation upon further appeal by challengers. Similarly, a new Trump Administration may choose not to appeal an adverse decision vacating an Obama Administration-issued regulation. However, to the extent that third parties have intervened on behalf of the regulations, those intervenors are permitted to defend or appeal the regulations themselves. Therefore, these options may have more limited effectiveness. Work with Congress to rescind regulations. 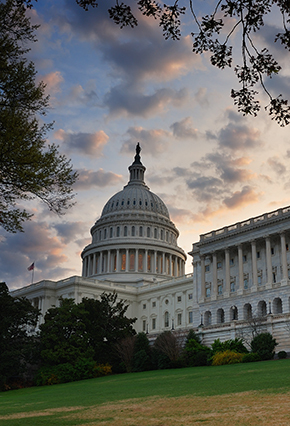 Congress can always step in to amend statutory authority underlying regulatory action or to defund implementation or enforcement of specific regulatory actions through the appropriations process. Senators opposed to congressional action that would repeal agency regulations or underlying authority may attempt to block such legislative action by filibustering the legislation thereby requiring 60 votes for passage. However, the Republican-led Congress may attempt to circumvent such obstacles by attaching statutory revisions or appropriations directives to “must pass” bills, or, for certain issues, by using the budget reconciliation process, which has been exempted from the 60-vote threshold to obtain cloture. It is also possible that a Republican Senate will do away with or limit the filibuster rate for legislation, which would open the door to more sweeping changes. Finally, President Trump may work with Congress to pass amendments to the APA or enact other legislation that would change the requirements for promulgation of or judicial review of agency regulations. “Regulatory reform” is an issue President-elect Trump has highlighted on his transition website and has been the subject of a number of bills recently passed by the House of Representatives. While never adjudicated in court, it has been common practice for incoming presidents—including presidents Reagan, Clinton, George W. Bush, and Obama—to direct agencies to not send signed final rules to be published in the Federal Register and to direct agencies to withdraw rules that have been sent to the Federal Register but have not yet been published. Unsent or withdrawn rules are treated as if they had never been promulgated and so the new administration may choose to make changes to a final rule or to not issue the rule at all, subject to specific statutory or judicial requirements. Rules that have been proposed but not finalized by the Obama Administration need not be acted on by the new Trump Administration, except to the extent that they are required by law or consent decree. Regulatory guidance—such as the recently issued Guidance for Federal Departments and Agencies on Consideration of Greenhouse Gas Emissions and the Effects of Climate Change in National Environmental Policy Act Reviews—by definition imposes no independent legal rights or obligations. As such it is not subject to the notice and comment procedures of the APA. A new Trump Administration could revoke such guidance without any procedural preconditions. Another tool available to the executive branch and used extensively by the Obama Administration is the executive order. Executive orders are directives issued by a president to federal agencies and officials. For example, President Obama has used executive orders to further environmental, immigration, labor and national security objectives. While executive orders can have sweeping impacts on executive branch action, their durability is more limited. An incoming president can unilaterally rescind prior executive orders without any procedural or legal constraints. If, however, an executive order directed an agency or department to issue a regulation pursuant to specific statutory authority, rescinding the executive order will not rescind the regulation. In addition to issuing regulations and executive orders, the Obama Administration may exercise specific statutory authorities in its final days. In some cases, the outgoing president can make designations under statute that cannot be easily reversed by an incoming president. The Obama Administration may further its goal of preserving public lands and natural resources by designating public lands—either onshore and offshore—as national monuments using the 1906 Antiquities Act. Because the Antiquities Act does not include language contemplating revocation of national monument designations by subsequent presidents, such a declaration by President Obama could be difficult to overturn by a later President, and Congressional action may be needed to accomplish such a result. Pursuant to section 12(a) of the Outer Continental Shelf Lands Act (OCSLA), the President may “withdraw from disposition any of the unleased lands of the outer Continental Shelf.” Accordingly, President Obama could utilize OCSLA section 12(a) to withdraw portions of the Arctic, the Atlantic, or the Eastern Gulf of Mexico from the federal oil and gas program. Like the Antiquities Act, section 12(a) of OCLSA contains no provision allowing future presidents to overturn withdrawals. Again, Congressional action might be needed to overturn such withdrawals. Van Ness Feldman is available to assist clients in understanding the types and implications of executive actions that may be taken in the context of the Presidential transition process. For more information, please contact Tom Roberts, Jonathan Simon, Doug Smith, R. Scott Nuzum, or Avi Zevin at (202) 298-1800.